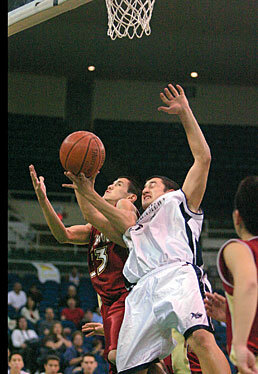 Kamehameha's Brandon Dumlao went up for a shot against Maryknoll's Richard Herring during last night's tournament game. They easily could have started a track meet with the run-and-gun Maryknoll Spartans. Instead, the fourth-ranked Kamehameha Warriors chose to put a boa constrictor's death grip around their speedy foes and eventually wore them down for a 46-40 win last night at Blaisdell Arena. Kamehameha got 12 points from Pii Minns and 10 from Auwae DeRego to beat Maryknoll for a third time in league play and fourth time overall. "Maryknoll's a good team," Minns said. "Mid-Pac beat Punahou and Maryknoll beat Saint Louis. Every night, anybody can beat anybody in our league." Using a sticky 2-3 matchup zone, Kamehameha improved to 9-4 in Interscholastic League of Honolulu play (20-6 overall) and advanced to the final of the third-place tournament, set for Kekuhaupio Gym tomorrow at 7 p.m. The Warriors face Saint Louis for a chance to play the Big Island's third-place team for a state-tournament berth. "Our zone is hard to break. It slows the game down so much," Minns said. Kamehameha coach Jesse Nakanishi also used his bench extensively, using 11 players in the first half. Maryknoll, which finished 5-9 in league play, was led by Ross Lum's 14 points. The Spartans shot 35 percent (14-for-40) and had 12 turnovers. Kamehameha shot 39 percent (14-for-36) against Maryknoll's man defense, but had an edge on the glass (26-22). The Warriors had nine turnovers. The lead changed hands four times before DeRego's drive in the low post gave the Warriors the lead for good, 30-29, with 45 seconds left in the third quarter. Fourth-quarter free-throw shooting was a huge factor for Kamehameha, which made 12 of its 19 attempts. The Warriors shot 16-for-25 overall, while Maryknoll was just 9-for-11. Foul shots by DeRego and Minns pushed Kamehameha to a 36-31 lead with 6:34 left. Maryknoll pulled within two, but got no closer. Kamehameha extended the lead to 46-37 on two DeRego foul shots with 32 seconds left to seal the win. The Warriors mixed man-to-man and zone defenses, and Maryknoll often struggled to get high-percentage shots. "I'm disappointed, but I don't really want to comment about it," Maryknoll coach Steve Hathaway said. In the second half, he questioned officials about a disparity in foul calls, but praised his team after the final horn. "I feel badly for our 10 seniors. I've been coaching them since they were seventh-graders," he said. "We controlled the tempo and Kamehameha's pressure didn't get to them. We just didn't knock the shots down." Kamehameha even used a box-and-one defense briefly in the first half after Maryknoll's Garrick Chock hit two open 3-pointers. "They didn't want us to come back," Chock said. Maryknoll's Richard Herring, left, and Kamehameha's Lamar DeRego locked up while going for a rebound during the Warriors' 46-40 win in the ILH tournament. MARYKNOLL -- Kent Kawahara 0, Brian Saxton 0, Tyler Terai 2, Scott Kamimura 6, Garrick Chock 8, Christian Kanei 0, Javen Correia 0, Dillon Keaney 0, Shelby Nakakura 0, Rian Huizingh 0, Micah Kalepa 5, Richard Herring 5, Jordan Napoleon 0, Ross Lum14. KAMEHAMEHA -- Kauila Miller 5, Edmund Kamano 4, Kawika Lyons 5, Chaz Bajet 2, Brandon Dumlao 3, Pii Minns 12, Auwae DeRego 10, Shawn Bode 0, Blake Viena 5, Damien Teramae-Kaehuaea 0, Kamakoa Downey-Jovanovich 0, Micah Christensen 0. 3-point goals -- Maryknoll 3 (Chock 2, Kalepa), Kamehameha 2 (Miller, Lyons). Lucas Gonsalves swished two free throws with 2 seconds to play, lifting the Crusaders over the Owls in dramatic fashion. Gonsalves, who finished with 14 points, had gone 0-for-9 from the line during the regular season. "I wanted to prove to my teammates that I could come through," the junior guard said. MPI's Ryan Kurihara missed a 44-foot prayer from midcourt as time expired, spoiling the upset hopes of Mid-Pac. 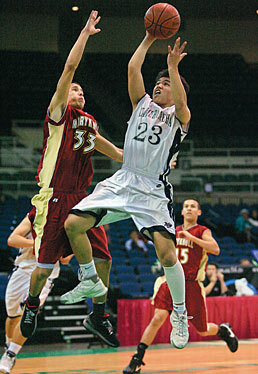 Cole Shidaki also scored 14 points for Saint Louis. Micah McClinton tallied 12 points. Devon Takenaka led MPI with 17 points. Kellar Ellsworth had 13 and Marcus Holyfield added 11. MPI did itself no favors by shooting 2-for-9 from the foul line in the final 1:08, allowing Saint Louis to rally from a 52-47 deficit. MPI had shot 10-for-13 from the line until the final minute. The Owls trailed 41-34 late in the third quarter, but came back with a 17-4 run. Takenaka's baby hook gave them a 51-45 lead with 3:36 to go. Saint Louis kept attacking the basket, however. "We were lucky. They missed free throws and it gives us a chance, opens a door for us," Crusaders coach Delbert Tengan said. "They played all the way to the final buzzer." MID-PACIFIC -- Sampson Won 3, Ryan Kurihara 9, Marcus Holyfield 11, Kellar Ellsworth 13, Devon Takenaka 17, Cameron Roberts 0, Sililo Pale 0. SAINT LOUIS -- Lucas Gonsalves 14, Micah McClinton 12, Corey Lum 3, Dean Viena 0, Kyle Gonzaga 0, Cole Shidaki 14, Marcus Umu 2, Michael Tuiloma 4, Jamison Miller 2, Moses Samia 3. 3-point goals -- Mid-Pacific 5 (Kurihara 3, Holyfield, Takenaka), Saint Louis 4 (Gonsalves 2, Lum, Shidaki). Michael Urcia's 19 points led the Patriots past the Lions and into tomorrow's tournament final against Lanakila Baptist at Hawaii Baptist. Kyton Keliiaa led Lutheran with 12 points. CHRISTIAN ACADEMY -- Michael Urcia 19, Abel Oristondo 9, Joshua Kaoiwi 0, Ryan Kobayashi 0, Axton Durand 6, Zachary Fu 4, Jake Okumura 3, Brett Koga 3, Jason Ko 14, Robert Helsham 0, Jathniel Manahan 2. LUTHERAN -- Joshua Perry-Krause 7, Michael Abang 5, Kyton Keliiaa 12, Shaun Takahashi 2, David Cho 7, Ryson Gander 11, Bronson Hagihara 0, Matt Nishiyama 2. 3-point goals -- Christian Academy 1 (Urcia 1), Lutheran none. Chase Hazelwood scored 28 points to lead the Warriors past the Dolphins into the D-II final. Bradley Foster's 23 points led Academy of the Pacific. LANAKILA BAPTIST -- Zachary Ramos 6, Joshua Pananganan 2, Armando Cayabyab 7, Micah Miranda 0, Keawe Ochman 9, Chase Hazelwood 28, Cole Deyoung 0, Christian Oasay 2, Glenn Yri 0. ACADEMY OF THE PACIFIC -- Evan Paresa 0, Bradley Foster 23, Christian Piimoku 0, Ikaika Ramos 10, Lopaka Davis 0, Nick Seaburg 11, Daniel Stanfield 8. 3-point goals -- Lanakila Baptist none, Academy of the Pacific 1 (Seaburg 1).